This item is no longer available. Please see item # 30635. 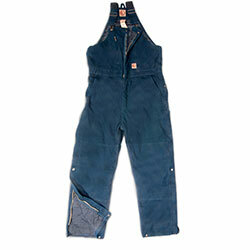 These quilt-lined bib overalls are durable‚ yet allow you to move around freely when on the job. They feature a 12-oz‚ 100% washed cotton shell with heavy-weight insulation quilted to 100% polyester taffeta from top to bottom. Insulated high-back design ensures added warmth. Triple-needle stitched main seams and four-needle stitched waistband with elastic inserts provide added durability‚ along with their heavy-duty nylon leg hems‚ reinforced knees and reinforced bartacks at all stress points. Overalls come equipped with heavy-duty brass zippers. Front zipper is a two-way zipper‚ and the leg zipper has an inside and outside storm flap with snap closures. You’ll always have a place for your stuff with two deep front pockets (one with a pencil slot)‚ side utility pockets‚ two reinforced hip pockets (one with a zipper)‚ a hammer loop and a tape measure loop. Machine wash and dry. Available in brown or dark blue.